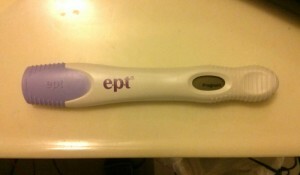 The first day after I got back from Wanderlust, I took a pregnancy test while my husband was at work. Tick-tock-tick-tock-tick-tock Pregnant! I did a legitimate double take and felt my eyes bulge. Then I smiled and laughed. I put the pregnancy test back on the bathroom counter where it had matured and paced around the apartment with my hands on my belly and a flurry of thoughts running through my head: Yay, I’m pregnant! Oh my God, I’m pregnant… How did this happen so quickly? How far along am I? How should I tell Richard? When am I allowed to tell other people? My dog, Foxy, diligently followed at my heels as I aimlessly ambled back and forth down the hallway. I finally decided I would go to a baby clothing store, get a shirt that said “big sister,” and cut leg holes in it so Foxy could wear it. The first thing Richard does when gets home is greet the dog at the door, so it would be the first thing he saw. Foxy and I walked up to Noe Valley in San Francisco, which is a hotspot for babies and dogs. It didn’t take us long to find a baby clothing boutique with a big sister shirt. The woman helping me asked me what size I needed. “Ummm,” I stalled guiltily, “Well, it’s actually for my dog.” She looked at me like I was nuts. “Okay, here’s what’s going on,” I admitted, “I just found out I’m pregnant and I want to tell my husband in a creative way, so I’m looking for a big sister shirt for my dog.” She was giddy that I’d let her in on the plan and proceeded to look through every single one of their used tops for me to try to find a cheaper used version of the shirt that I could justify cutting holes into. No luck. I almost bought the pricey brand new shirt, but I knew Richard would start obsessing about how we were going to pay for the baby’s college education as soon as he found out we were pregnant, so I decided to reformulate my plan. 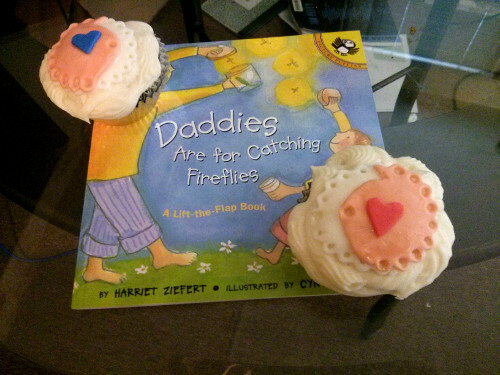 When Richard came home Monday night, I had a couple homemade, hand-decorated cupcakes waiting for him with a sweet interactive picture book I found. A little overwhelmed, he came and curled up beside me on the couch and we read “Daddies are For Catching Fireflies” together. Once I got that positive test, my hint of nausea turned into overpowering nausea. I made the mistake of telling Richard that I suspected the nausea was at least partly psychosomatic, and he never let that go. Maybe it is just in my head, but I certainly don’t know how to turn it off! It had been over eight weeks since my last period started. I didn’t think I was that far along, but I thought I’d better see—see—um, wait, who do you see when you’re pregnant? That was the first thing I had to figure out. Google told me to make an appointment with an OB/GYN. I found one that was close to our new house, had pretty good Yelp reviews, and happened to have an appointment available. In that moment, I was too overwhelmed to consider anything beyond those criteria for choosing someone to potentially deliver my baby. I just wanted someone with authority to tell me everything was going to be okay. I didn’t have a full enough bladder to get a urine test at the beginning of the appointment to confirm my pregnancy. As such, the whole appointment was phrased in terms of “if you’re pregnant.” She told me that at my age, there was about a 15% rate of miscarriage. If we found a heart beat on the ultrasound, that risk would drop down to 3%. We didn’t find a heart beat on the ultrasound—it was too early. (Side note: If you’re going in for your first appointment, Google transvaginal ultrasound ahead of time to set your expectations. I did not even know this was a thing, and it caught me off guard). The doctor pointed to a tiny black dot on the screen and said, “If you’re pregnant, that’s the baby. If all goes well, we’ll see that spec grow over time.” Obviously the doctor needed to protect her liability, but the language of the appointment left me feeling detached. After finally confirming I was actually pregnant via a urine test at the end of the appointment, she sent me home with some reading material. I read a small booklet about screening tests when I got home. All of the ones recommended for my age detected 50-90% of chromosomal abnormalities, and had the proviso “most women who test positive [for chromosomal abnormalities] give birth to healthy babies.” I couldn’t help but think that getting tested might not be worth the stress of getting a false positive. Richard and I would discuss more in the weeks to come. The other book was a manual on pregnancy and childbirth, and the longest chapter was about common discomforts of pregnancy. I got used to reading, “There are no safe medications to relieve X during pregnancy.” However, there were a ton of alternative suggestions for each discomfort, which turned out to be invaluable! This entry was posted in Mindful Pregnancy and tagged cupcakes, joy, pregnancy, uncertainty by Barbie. Bookmark the permalink.